Safety Boat Services are delighted to announce their collaboration with The Ultimate Boat Company. SBS Director, Daniel Ross, has snapped up the first two production slots for their new range of boat The “Barracuda” which has been designed for the Commercial Market. The “Barracuda” range is a versatile boat and will be available in the following configuration options: conventional, safari and wheelhouse with either inboard or outboard engines from 5 metres to 15 metres. This “beastie” of a 13 metre commercial wheelhouse is going straight into build at The Ultimate Boat Company facilities in the Highlands of Scotland. 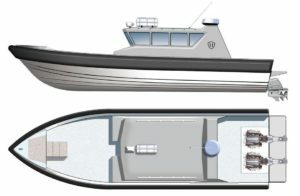 This particular wheelhouse version can accommodate 14 people (2 crew and 12 passengers) all seated on suspension pilot seats and configured in rows of four with a central aisle. The various development and build programmes and the upcoming interview with the designer can be followed here on their facebook page.